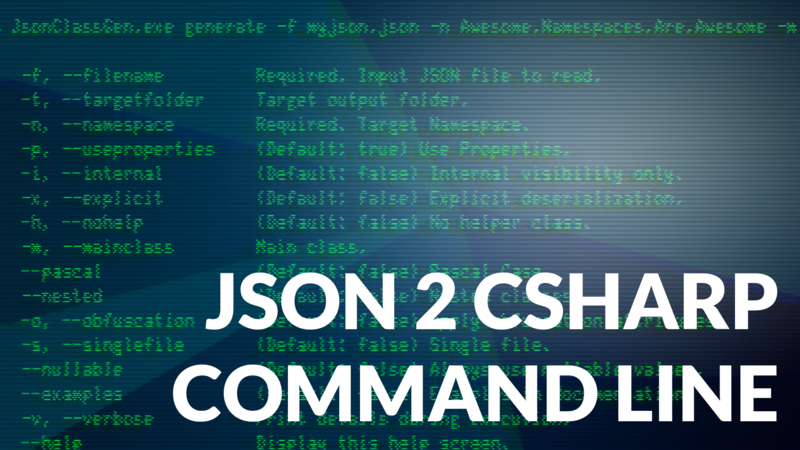 I needed a command line wrapper around the fantastic json2csharp library to generate C# code. So I wrote one. It’s not 100% done yet, but does most things, and includes batch support for build pipelines. Generates all the code based on the configuration file. Options file is in the format below. Options are standard across all the classes to create consistency. If, for example, you want some files visible internally and other not, create a seperate config. That way you know what you’re exposing clearly. Generates the code based for a single json file. The below example generates nested classes in a single file using Pascal case, with the main class for the json file “MainClassName” with the awesome namespace. -f, --filename Required. Input JSON file to read. -t, --targetfolder Target output folder. -n, --namespace Required. Target Namespace. -p, --useproperties (Default: true) Use Properties. -i, --internal (Default: false) Internal visibility only. -x, --explicit (Default: false) Explicit deserialization. -h, --nohelp (Default: false) No helper class. --pascal (Default: false) Pascal Case. --nested (Default: false) Nested classes. -o, --obfuscation (Default: false) Apply obfuscation attributes. -s, --singlefile (Default: false) Single file. --nullable (Default: false) Always use nullable values. --examples (Default: false) Examples in documentation. -v, --verbose Print details during execution. --help Display this help screen. What’s the code look like?